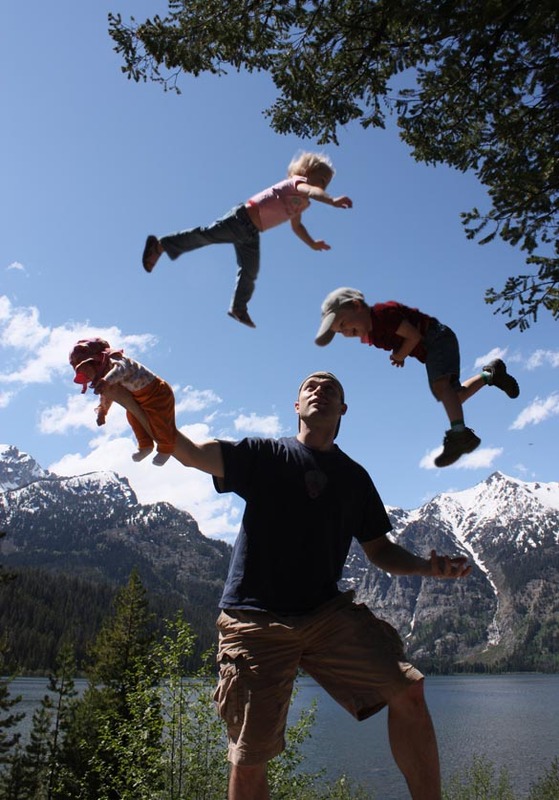 Mark Wilcox is a professional writer and photographer living with his family in beautiful Jackson Hole, Wyoming. Beside loads of freelance writing, Wilcox also manages to write blog posts for his own blog: apparentparent.blogspot.com, which is featured on mormondaddyblogs.com. He has three kids that keep him busy as a loving "Daddy" to his children. Anyone can be a father, but it takes someone else entirely to be "Daddy." Wilcox writes about that little extra magic it takes. His topics vary widely from family outings to advice on bedtime from the battleground itself. The syntax makes me wonder if it was Yoda. I'm learning after our third child arrived last week just how true the principle is. Before, my wife would take one child and I would take the other, keeping mischief to a somewhat manageable minimum in the process. However, after my wife delivered our newest daughter with some complications, the man defense has been tossed. Now, my resting wife's zone happens to be a very large armchair with a sleeping infant on her chest. Since she's on doctor's orders to rest, relax and recuperate, I'm pretty okay with that, if not a little jealous. Let's just say my zone covers a little more ground. Not that I'm complaining. I saw what she went through this week between childbirth and complications. The chair is hers, dangit. Part of my zone is outside where I take the kids to the park. I get steamrolled, grass-stained, jumped on, slid upon and more. My kids ask me to climb the playground equipment in an odd place, which means doing it all with upper body strength. I dutifully ratchet myself up some bars going across a bridge, only to find I have seriously strained some muscles in my neck and shoulders, giving me the equivalent of a kinked neck after a week of camping on sharp granite boulders without a pillow. Park time is over, but the zone defense has only just begun. Returning home, I fertilize the lawn while doing my best to keep stray children from swallowing the weed pesticides in the lawn feed because they look like yellow Nerds. Then my zone hops in the swagger wagon and goes to the store. My kids beg to get their own little grocery carts to help me pick up a grand total of four items. I relent, thinking I can manage for just four items. I rejoice when all the small carts are gone from their normal keeping place. This is the last time I'll rejoice before bedtime in my zone. I spend a good half hour vainly herding children when my daughter informs me she needs to go potty. Now. Exasperated, I toss the two items I’d managed to find on top of some feminine hygiene products and race my daughter into the bathroom, where someone has viciously sprayed the entire seat with man urine. “Are you serious?” I say out loud. My daughter takes my exclamation up as a chant and turns it into a song, altering the words to her own as time goes on. “Are you serious, are you serious, are you pear hook, are you bear head...” etc. It's actually really cute, especially when combined with the potty stalling dance she's doing. So while she sings I do a quick wipe down on the toilet seat with a wad of toilet paper fat enough to choke Rosie O'Donnell. I rocket the singing and dancing girl into place on a toilet protector hoping it'll do its job. When all is done there – I won't go into detail – I go back and pick up my two items off the feminine hygiene shelf and find the third by a miracle. The fourth remains elusive, even after talks with store reps while watching children disappear into the vitamin aisle. I'm amazed by this point I have had the wherewithal to avoid making child-shaped holes in any walls. I take them to another store and, having learned from experience, I put them in a cart and wheel them directly to the baby portion of the store where I find the item immediately. My kids want to see toys. I take them to the toys. I spend a long time at the toys. I haul kids whining about me not buying them toys away from the toys. I pick up an enormous plastic jar of comfort food on the way to the checkout. When we make it to the car, the kids get their fiesta on in back. Not wanting to chase them down with a sore neck in a cramped space, I do the only logical thing I can think of: I tell them I'm leaving and start to drive. Like mice sniffing cheese at the maze's end, they scurry to their seats, where I can then buckle them into place for the final push into the endzone. Upon arrival at home, I feed them a hasty dinner of cinnamon toast and put them to bed alone while my wife cuddles our infant daughter on the couch, mostly asleep. In case you hadn't figured it out yet, zone defense is a lot harder to play than man defense. I just hope it isn't like this every day, or I'll find a way to switch back to man, no matter what Yoda has to say.